Ever since Kevin Durant got a signature sneaker deal with Nike upon entering the league, the two-time NBA champion has made it a point to honor his late Aunt Pearl. The sneakers in the Aunt Pearl collection typically contain a lot of pink and these new KD 11's are no different. 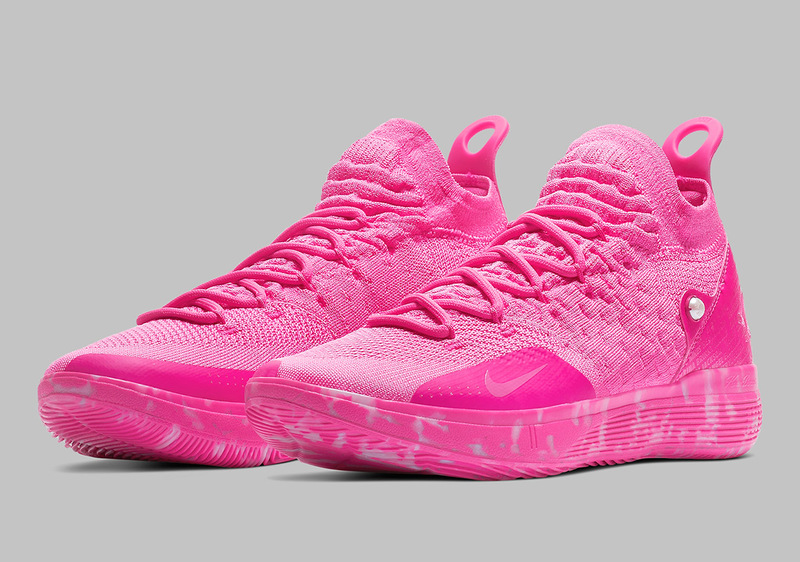 For this particular shoe, Nike and Durant have teamed up with Kay Yow Cancer Fund. The sneaker will contain the names of 59 cancer survivors on the heel counter, as well as the custom insoles. In addition to the names of the survivors, the entire sneaker will be dressed in pink which is, of course, the official color for Breast Cancer Awareness. The shoe itself is made up of the same materials as the original KD 11 which means they will be ready to go for the court. The midsole is pink as well but has some subtle hints of white throughout. According to Sneaker News, these basketball sneakers will be released on February 14th along with Nike basketball's other All-Star weekend shoes. These will retail for the standard KD price of $150 USD. Those who have had someone close to them go through cancer will surely appreciate the meaning behind these kicks. Will you be looking to cop next week?